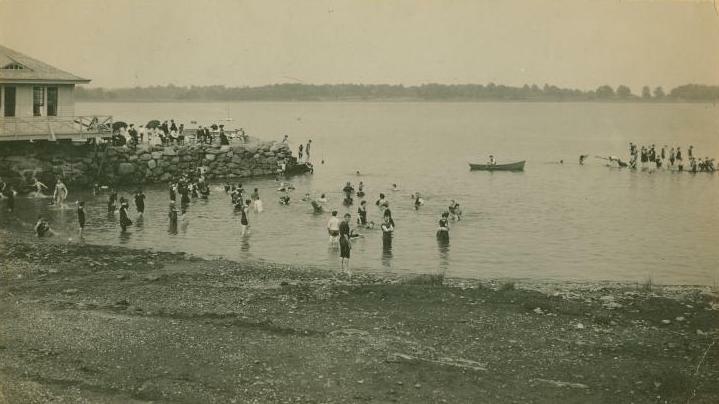 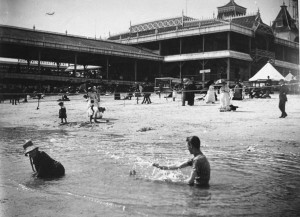 The notion of organized ‘ocean bathing’ — actually going into the water for health, relaxation and enjoyment — was really a 19th century invention, first popularized in the United States during the 1830s at the Marine Pavilion on the Rockaway Peninsula. 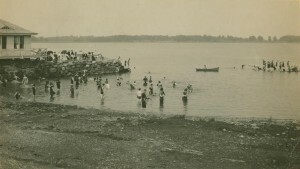 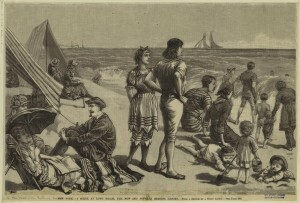 For propriety’s sake, people would enter a bathing hut hitched to a horse and ride the container as it was backed into the water, exiting from the hut in their full-body swimming apparel only when safely immersed in the water. 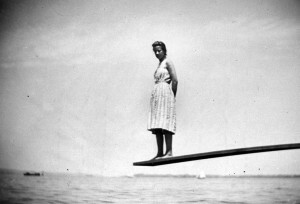 No risk of seeing wet fabric clinging seductively to the human form! Fifty years later, bathers would dare walk to the beach sans horse-drawn hut. But their beach apparel still matched the modesty of their regular wear. 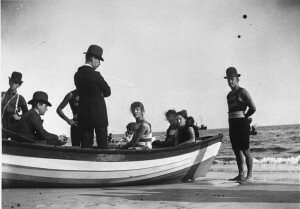 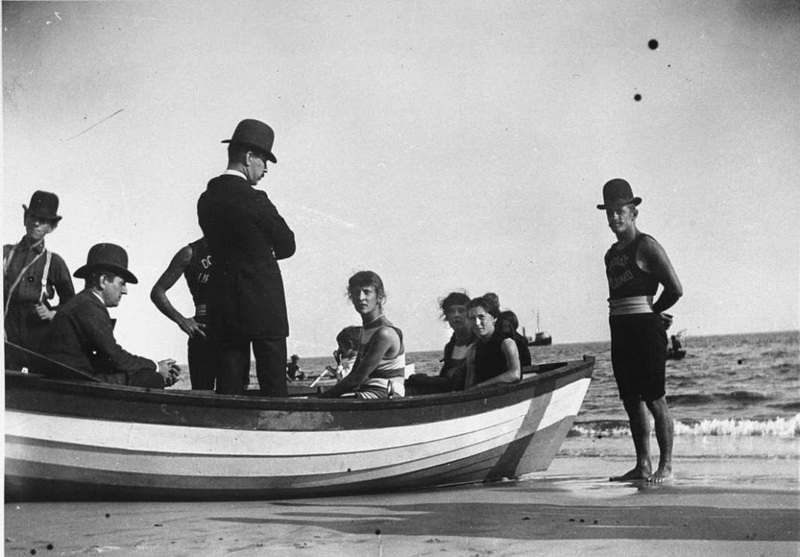 Here are a few examples of garments — for sunbathing, swimming or just relaxing — worn at some of New York’s most popular beaches of the late 19th-early 20th century. 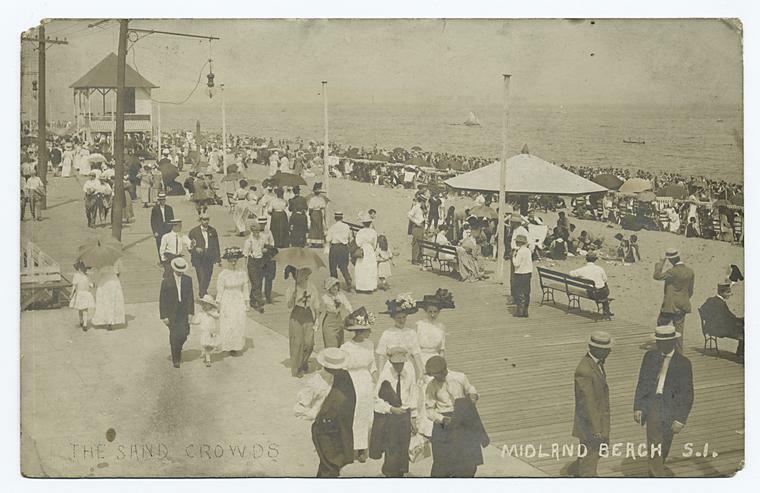 Classing it up a little with the ‘sand crowds’ along the Midland Beach boardwalk in Staten Island, no date, but probably between 1900-1910. 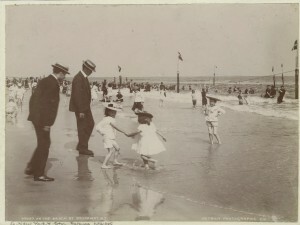 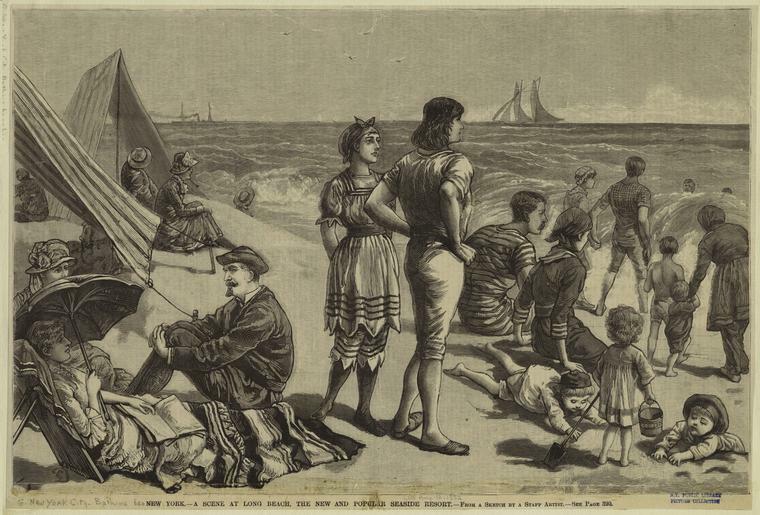 The dapper sea threads adorning the trendy beachgoers at Long Beach, 1882. Okay, this is technically in Nassau County, not New York City proper, but how could I not give these styles a showcase? 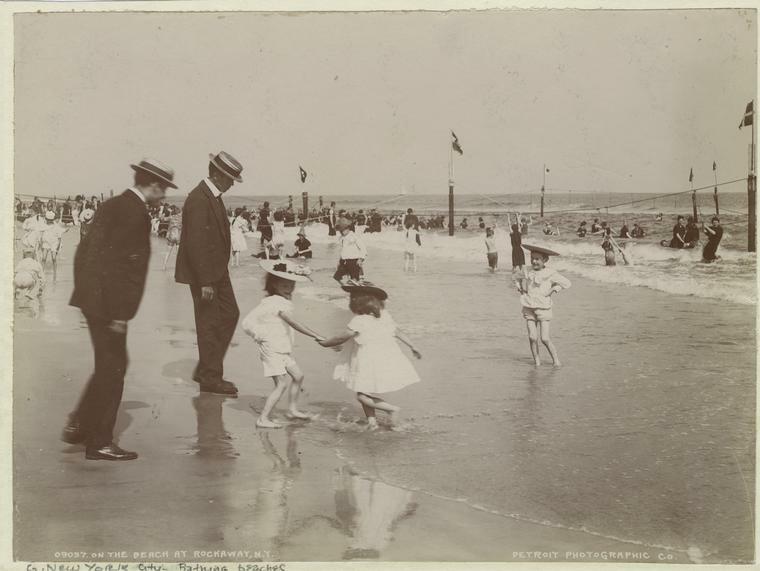 Check out little Minnie Pearl and her fine hatted friends at Rockaway, date unknown. 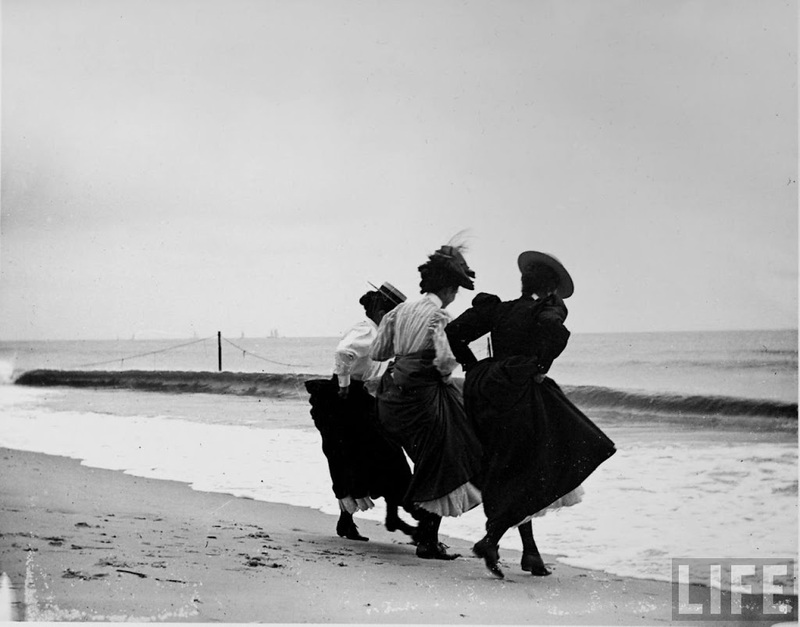 And finally, I’m not quite sure this avant garde look ever made it onto the beach. 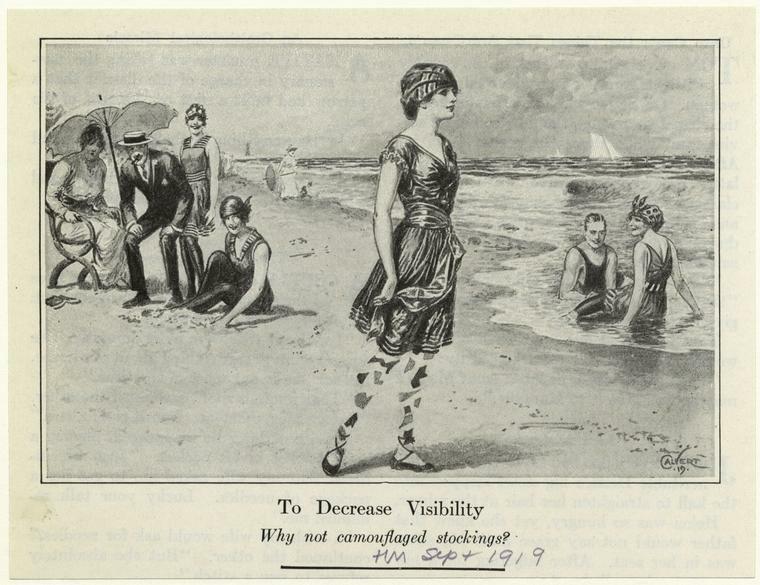 But if you want to look like you’re floating over the beach without legs, why not try these camouflage beach leggings, advertised in Harper’s Magazine in September 1919?